Covering everything from Edison to Avatar, Gomery and Pafort-Overduin have written the clearest, best organized, and most user-friendly film history textbook on the market. It masterfully distills the major trends and movements of film history, so that the subject can be taught in one semester. And each chapter includes a compelling case study that highlights an important moment in movie history and, at the same time, subtly introduces a methodological approach. This book is a pleasure to read and to teach. Peter Decherney, University of Pennsylvania, USA In addition to providing a comprehensive overview of the development of film around the world, the book gives us examples of how to do film history, including organizing the details and discussing their implications.Hugh McCarney, Western Connecticut State University, USADouglas Gomery and Clara Pafort-Overduin have created an outstanding textbook with an impressive breadth of content, covering over 100 years in the evolution of cinema. 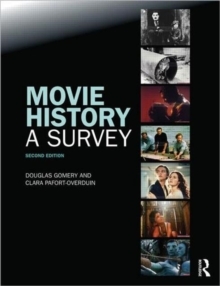 Movie History: A Survey is an engaging book that will reward readers with a contemporary perspective of the history of motion pictures and provide a solid foundation for the study of film. Matthew Hanson, Eastern Michigan University, USAHow can we understand the history of film?Historical facts don't answer the basic questions of film history. History, as this fascinating book shows, is more than the simple accumulation of film titles, facts and figures. This is a survey of over 100 years of cinema history, from its beginnings in 1895, to its current state in the twenty-first century. An accessible, introductory text, Movie History: A Survey looks at not only the major films, filmmakers, and cinema institutions throughout the years, but also extends to the production, distribution, exhibition, technology and reception of films. The textbook is divided chronologically into four sections, using the timeline of technological changes:Section One looks at the era of silent movies from 1895 to 1927; Section Two starts with the coming of sound and covers 1928 until 1950; Section Three runs from 1951 to 1975 and deals with the coming and development of television; and Section Four focuses on the coming of home video and the transition to digital, from 1975 to 2010. Key pedagogical features include:timelines in each section help students to situate the films within a broader historical context case study boxes with close-up analysis of specific film histories and a particular emphasis on film receptionlavishly illustrated with over 450 color images to put faces to names, and to connect pictures to film titlesmargin notes add background information and clarityglossary for clear understanding of the key terms describedreferences and further reading at the end of each chapter to enhance further study. A supporting website is available at www.routledge.com/textbooks/moviehistory, with lots of extra materials, useful for the classroom or independent study, including:additional case studies - new, in-depth and unique to the websiteinternational case studies - for the Netherlands in Dutch and Englishtimeline - A movie history timeline charting key dates in the history of cinema from 1890 to the present dayrevision flash cards - ideal for getting to grips with key terms in film studiesrelated resources - on the website you will find every link from the book for ease of use, plus access to additional online materialstudents are also invited to submit their own movie history case studies - see website for detailsWritten by two highly respected film scholars and experienced teachers, Movie History is the ideal textbook for students studying film history.